Cards! Presents! Decorations! But don’t forget Child Protection! 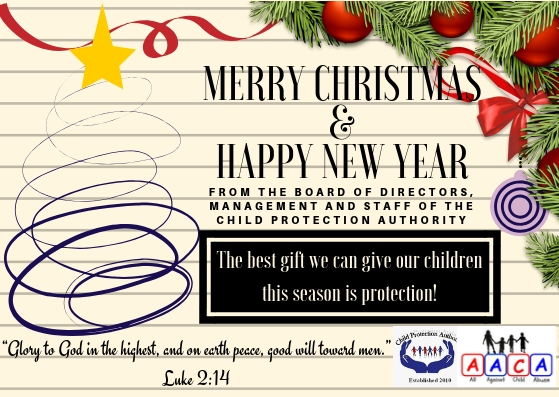 Season’s Greetings from the Child Protection Authority! As the nation begins planning for Christmas presents, food and parties, we would like to remind all that it is also the time to be vigilant and mindful of potential risks for our children. Practicing kitchen safety – minimise potential accidents by keeping young children, in particular, out of the kitchen as much as possible. Place sharp objects, matches, plugged appliances, hot substances etc. out of reach. Giving age-appropriate gifts. Toys are attractive gifts but put safety first. Read packaging information to ensure the toy is suitable for the child’s age and developmental stage. Keeping children away from beverages containing alcohol. It may be Christmas but remember that it is neither legal nor safe for children to consume alcohol. Having a trusted and responsible adult supervise children in your absence. Encouraging healthy eating habits. Overeating can result in weight gain and health problems in children. Teaching children to be appreciative and content. Christmas is not just about material things, but quality time with family and friends. Keeping open communication with older children so you can know their whereabouts and company, especially on Christmas Eve, Christmas Day and Old Year’s Night and New Year’s Day. Leading by example. Do what you would want your children to do. Be wise, respectful, and moderate. Model the attitude you’ll like to see in your children. Having a family plan in place in case of an emergency and sharing that plan with family members. Loving, respecting and protecting the children in your lives at all times. If at any time any form of child abuse is brought to your attention, please contact the Child Protection Authority on 440-6980, 435-0293, or our emergency number 533-6990. Child protection is our year-round duty. Let’s make this December holidays a safe and secure time for all our children. Happy Holidays to All!